This is meant as a walk through for us shade tree mechanics who don't really know what we're doing. Always adjust the valves on a cold engine. Preferably, let it rest overnight and do it 1st thing in the morning. We have an one overhead camshaft, with two lobes, one for intake and one for exhaust. The lobes push on the rockers. Each rocker has two rocker arms, which means we have four valves. The end of each rocker arm is threaded to accept a screw. As the cam turns, it pushes the rocker arms up and down. The screws push on the end of the valve stems. The screws are secured with nuts above the rocker arms. These nuts are "lock nuts." In the following diagram, the rocker arms are the bird foot looking things, more or less labeled "10" and "7." The valve stems are labeled "31" and "30." The adjustment screws are "11" and "8," and the locking nuts are "12" and "9." It is between the end of the adjustment screw and valve stem that you will be measuring the valve clearance. Should be between .003" and .005"
Before removing any covers, now's the time to do a little house cleaning. Blow the dirt from around the spark plug and inspection covers. You don't want to toss in some dirt in your engine at this point. 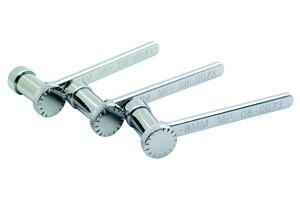 Remove both valve inspection covers with a 10 mm wrench. Put the covers somewhere clean and safe. Inspect the stock bolts, they are soft and will snap if over torqued. They are M6 with a 1.0 pitch. Now we must set the cam position properly. This is probably the most common error. The trick here is to find Top Dead Center (TDC) on the compression stroke. This is a 4-stroke engine, so the piston goes up and down twice, and the flywheel turns 2 whole rotations (720 degrees) for every 1 time the cam goes around. Remove the timing port cover. It's preferred to use a 17 mm socket with a breaker bar and turn the flywheel COUNTER CLOCKWISE. The Clymer manual has this wrong! It says to go clock wise! NO! You want to turn the flywheel in the same direction the wheels turn while going forward. Turn the flywheel around several times while watching the rocker arms and the adjusting screw go up and down to get a feel for what's going on. As you turn the crankshaft, keep an eye on the intake valves. They open immediately before the compression stroke. So watch them go down then come up, next time the mark on the crank lines up with the mark on the case, you will be at TDC on the compression stroke. Note both sets of rocker arms with the adjusting screws are up. The lobes on the cam will be down, but you can't see this. The piston is at max height, use the screw driver or plastic straw in the spark plug hole to determine this. There should be a little play in the rocker arms now. Check that the timing marks on the flywheel and the crank case more or less line up. Don't be afraid to keep turning the flywheel counter clockwise until you get the hang of it and are confident that you are at TDC on the COMPRESSION STROKE. You can use a 17 mm deep socket w/a rachet, but this is tricky. Due to inertia, the ratchet tends to let the flywheel spin past where you want it to be. That's the way ratchets work; they are free to spin in one direction. Put the bike in a high gear and push it forward... while watching the rocker arms and timing port. Or jack up the rear wheel and spin it in the forward direction. Now we can actually measure the valve clearance and adjust it if necessary. Take your feeler gauge out. The specs call for a clearance of 0.003" to 0.005" for both intake and exhaust. In mm, it's 0.08 mm to 0.13 mm. Make sure the gauges are clean and free of dirt. Oil is okay (they will be oily afterward anyway). Put the smallest gauge between the bottom of the adjustment screw (e.g. part number "11") and the end of the valve stem (e.g. part number "31"). If it fits, that's okay. Keep moving up in sizes until they won't fit. See a) through c) for the various cases. As for actually getting the gauges between the adjustment screw and the valve stem, it can be tricky. What I recommend: 1st, make sure there is plenty of light. If you are on the left side of the bike, measure the clearance on the right side while holding the rocker arm up with your other hand (remember there should be little play). Even if the gauge will fit, it may be tricky to get it in there. Practice sliding it in and out until you are sure you are measuring the right thing! I had the most success pushing the gauge straight in, but you can get them in from the side. If the 0.005" fits, but not the 0.006", the clearance is to spec. Go to step 6) of "ADJUSTING THE CLEARANCE." However, you may want to tighten them up just a little. Your call. If the 0.003" won't fit, your valves are too tight. Go to "ADJUSTING THE CLEARANCE." If the 0.005" fits, try the next size up. If the next size up and so forth fits, the clearance is too loose. Go to "ADJUSTING THE CLEARANCE." If your valve stem - rocker arm adjustment screw clearance is out of spec, it's time to adjust the clearance. Now the 10 mm offset wrench comes in very handy. You can also use a 10 mm socket w/ a ratchet (1/4" drive is easiest), but you can't hold the screw in place while you tighten the locking nut later w/ the ratchet. You may be able to get a regular 10 mm wrench in there, but not easily and you may mess up the nuts. Loosen the locking nut(s) with the 10 mm wrench. This means turning the nut counter clockwise as you look down on it. This will bring the nuts "up," towards where the gas tank would normally be. If you are still not sure, point the thumb on your RIGHT HAND up, and your fingers will point in the direction you should turn the wrench. Don't go crazy, sure and steady doesn't strip the nut or bend the adjustment screw. DO NOT REMOVE THE NUTS. If they fall into the engine... well, God help you. With a flat head screw driver, loosen (same direction as immediately above) the adjustment screw. Insert the CLEAN feeler gauge of your choice between the adjustment screw and the end of the valve stem as before. I used the 0.004". With the gauge still in there, tighten the adjustment screw. You should be able to remove the feeler gauge with a small amount of effort, i.e. there should be a little pressure on the gauge, but not a lot. Finger tighten the locking nut. Put the 10 mm wrench back on the the locking nut, and put the screw driver into the adjustment screw. Hold the screw in place and tighten the nut. Recheck the clearance. If it is out of spec, go back to step 1). You must do this for all 4 valves. If you are successful, you are nearly done, but I STRONGLY RECOMMEND TURNING THE FLYWHEEL SEVERAL TIMES, RESET IT TO TDC ON THE COMPRESSIONS STROKE, AND RECHECKING THE CLEARANCES ON ALL FOUR VALVES. If the clearance is good, bolt everything back up. If you have a torque wrench, you can get at the exhaust (front) bolts fairly easily, but not the rear ones (well, with a 3/8" drive, anyway). If you do not have a torque wrench that fits, use your 10 mm wrench. Tighten them firmly, but again, don't go crazy. Finger tight and then a bit more than wrench firm, maybe 1/8 to 1/4 turn. 6-8 ft-lbs is the proper torque. When reinstalling the timing inspection plug, make sure it is not cross threaded. Once the covers are back on, you should still have some gas in the carb. Start the bike up and listen. You should hear SOME valve noise, but not a lot. IF YOU HEAR LOTS OF VALVE NOISE, YOU PROBABLY ADJUSTED THE VALVES AT TDC ON THE EXHAUST STROKE. START OVER. This loud noise will be really obvious. You've never heard it before on your bike. Do not ride it. Let the engine cool overnight, go get drunk, and start over tomorrow. Great writeup, as usual. Thanks! Because of the design of the rocker arms, I feel it is good practice to perform the clearance measurements with feeler gauges inserted at each position (i.e. two feeler gauges inserted when measuring the intake side (one for each intake valve stem - same drill then applies when getting the exhaust measurements). Yeah, it's a tight fit, but I have had good luck using these feeler gauges. What kind of tool is being used to remove the timing inspection plug? Could a screwdriver do the job? but many times the plug can be stuck and a plain screwdriver just wont do the trick and you'll end up with a scared up plug. you want one that'll fit in the slot tightly from end to end. mine is made from an old brake pad. these work ok for the exhaust, but are too tall for the intake. or my own creation, a similar tool using a hex drive screwdriver tip pressed into a fender washer. scribe lines thru the center and at 90° and there you go, almost don't need feeler gages. 90° is about .006", so you just need to back off a little from a 90° turn. When a valve tic goes to a clack. Check the clearance of the decomp cam. When the rockers or cam lobes wear the clearance goes to zero. This post saved me from taking the bike to a shop to have the valves adjusted. I have taken it apart so many times now I can do it in my sleep. And after many months of trying to get the valves to quiet down I found out here that the book I have is WRONG. Good thing I didn't ride it any and no harm to engine came from it. I kept saying to myself that something isn't right here. And when I read that you turn the engine over counter clockwise it all made it good. Thank YOU for posting !! !